Andrea Huber, center, is getting married in a few weeks. She and her friends included Saturday's Bundle-Up 5K as part of her bachelorette party. WENATCHEE — When Wenatchee dresses up, it really dresses up. 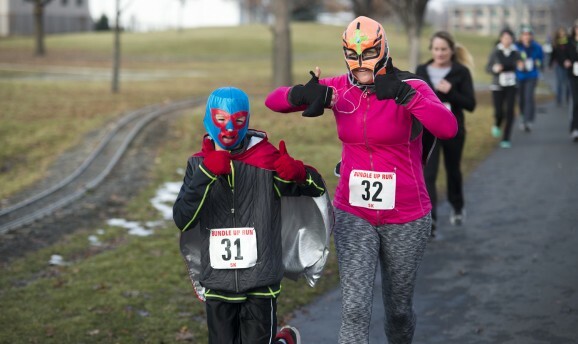 Nearly 700 runners and walkers hit the Apple Capital Loop Trail early Saturday afternoon as part of the annual Bundle-Up Festival 5K and 1K, with many sporting costumes that ranged from the comical to the colorful. There was a Superman, a Batman and a Catwoman, of course, along with a gorilla, a tiger, a woodsman, and a cowgirl. 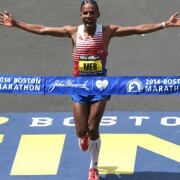 Others ran in suits, ties, skirts, tutus, wedding dresses, graduation gowns, Hawaiian shirts, hockey gear, wigs, and even boots. RunWenatchee knows who these two are, but we've been sworn to secrecy. Oh, and with the Super Bowl just about a week away, there were plenty of folks adorned in Seattle Seahawks gear. 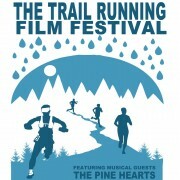 A total of 683 people registered for the event. A year ago, about 500 registered. While the Bundle-Up 5K is not officially timed, there is a running clock provided by the beneficiary, the Wenatchee High School Cross-Country Team. Fittingly, a couple of Wenatchee High runners — senior Austen Lane and fellow senior Garrett Britt — finished first and second with unofficial times of 18:08 and 18:12. The run and walk is held in conjunction with the Bundle-Up Festival, which took over the adjoining Stanley Civic Center Plaza and featured hay rides, a fire pit, s’mores, L-Bow the Clown, community booths and entertainment. Many of the kids who took part in the 1K run enjoyed the festival prior to their run. Andrea Huber and her “entourage” won the Bundle-Up costume contest by coming as a wedding party. It wasn’t entirely made-up, either. 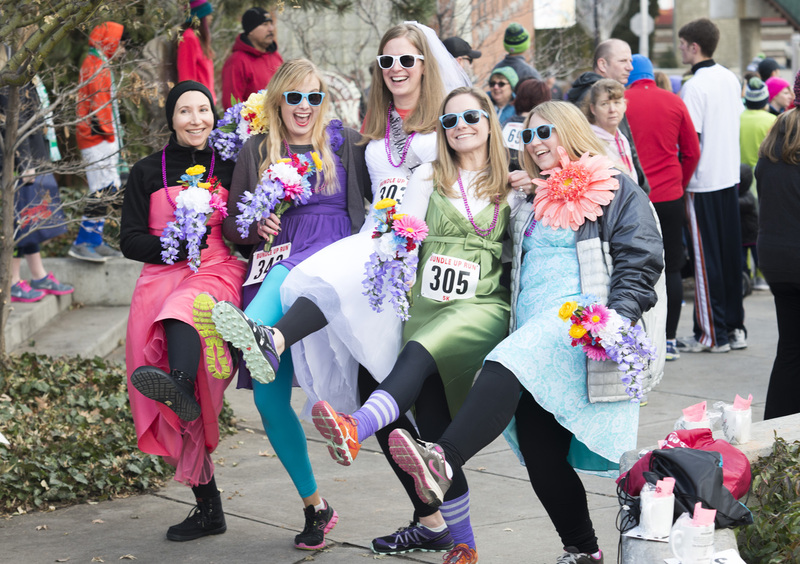 Huber is getting married in February, and she and her friends — Allison Dorenbosch, Jennie Pierce, Arina Ferchland and Rebecca Wachtel — decided to include the Bundle-Up Run as part of her bachelorette party. 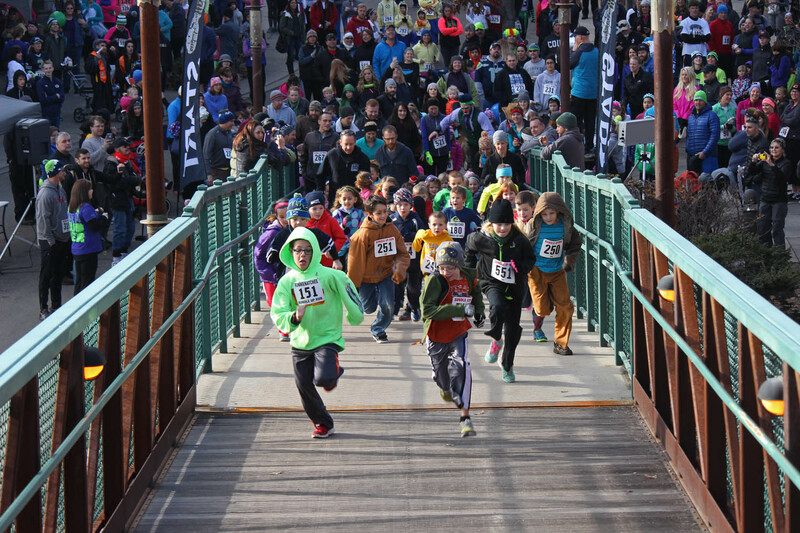 Kids take off from the starting line in the 1K run. The 1K Kids Race preceded the 5K race. “We wanted to get in a little exercise before the drinking,” Huber said, laughing at the thought of what their later plans included. For others, Bundle-Up represented a chance to get outdoors in the middle of winter. On Saturday, highs were in the upper-40s with breaks in the clouds. For Wenatchee’s Karl Rowland, it was his first official race since a Snohomish half-marathon in October. 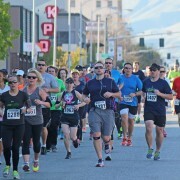 Following Bundle-Up, he plans to take part in the Wenatchee Half-Marathon in April. Carl Hagerty said Bundle-Up provides a great reason to get out. A few minutes later, a woman dressed in a fake-mink coat strolled by a crowd, which included the race’s official photographer. “I’m all ‘Bundled-Up,'” she said, to know one in particular.